Procrastination and negligence of concerned authorities precipitate natural disasters and prolong sufferings of affected people, says DILRUBA HAIDER. 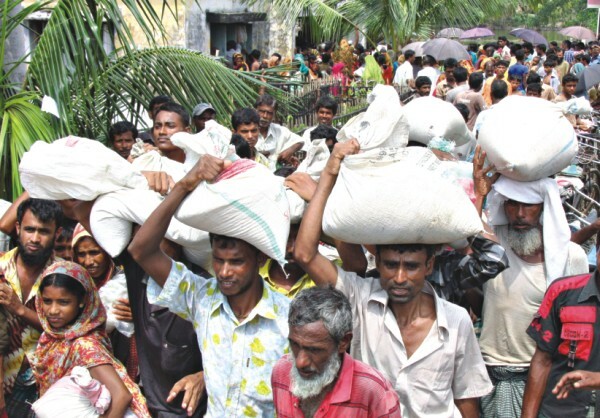 Three years have passed since Aila hit the south western coastal Districts of Khulna, Bagerhat, Satkhira. 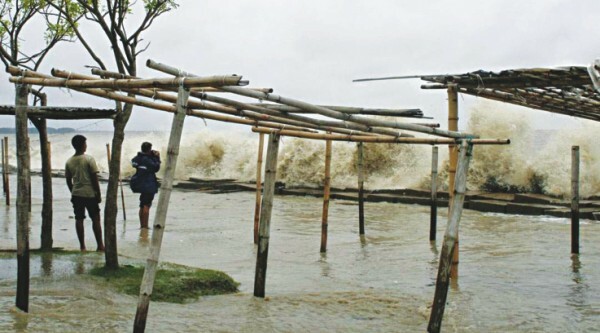 It was a category 1 cyclone but occurred when the people were struggling to overcome the devastation inflicted by category 4 cyclone Sidr that had razed through the land one and half years ago (November 2007). Aila damaged the long strip of embankments, and ever since a significant portion of that long strip is standing breached letting saline water gushing in twice every day to the (former) paddy fields and shrimp enclosures. Thousands of residents of South Betkashi union of Koira have been living on embankments and tongs (house built on raised platform made of bamboos over the water). A vast area of over 5,000 acres of the union was being salinised twice every day. Some 8,321 households in Khulna, Satkhira and Bagerhat, according to ECHO partners' assessment as of March 2011 were languishing in poor living condition. Ecological balance, drinking water source and paddy fields were destroyed due to continuous saline water intrusion. After almost one and half year after Aila, 1700 kilometres of the protection embankment came under repairing works of the Bangladesh Water Development Board (BWDB) in October 2011. According to local people, the breach on the embankment at Betkashi was only 10-feet wide immediately after the cyclone Aila, but it widened fast and became 60 metres wide by the time the government took its first repairing step towards the end of 2010 and continued till February 2011, yet failing to seal the crack. The second phase of repairing began in March 2011, but by then the crack had become 130 metres wide! Over six thousand shrimp and sweet water fish enclosures in Bagerhat were washed away by tidal waves amid incessant rain in mid June 2011. District Fisheries Officer said, farmers incurred a loss of Tk 4.6 crore as 6,271 ponds and shrimp enclosures in the district were washed away due to tidal surge gushing in through the breached embankments and heavy rain. Aus paddy of 4,500 hectares of cropland was also affected by submergence of saline water. Aila turned into a disaster mainly due to breach in embankments. The dilapidated embankments, almost 50 years old and desperately lacking maintenance just caved in. BWDB and Union Parishads that are responsible for the maintenance of earthen embankment failed to carry out their responsibilities. And the result was disastrous, impact of which is still telling on the faces of the all-lost people living in the south west. The wrong operation of Hirakud Dam was mostly responsible for the flood in Mahanadi basin, Orissa, India in 2008. Since Aug 1, 2008 the Hirakud dam operators had kept the water level at the Dam way above the rule curve recommended for the dam in 1988. Had the dam operated properly to keep the water below the recommended level, the flood disaster could have been avoided. Hirakud dam has flood control cushion in its storage capacity. The idea was that the flood cushion portion of the storage should not be filled till the end of the monsoon, which is in the first week of October. By filling up the reservoir to full capacity before the end of monsoon, the dam operators had diminished the flood control role of the dam. Similar incidents had happened in 1982 and 2002, yet the concerned authorities didn't take any lesson; yet once again they did the same mistake and caused untold sufferings to huge number of poor people of the Orissa coast in 2008: 20 lakh people of 2960 villages in 17 districts were affected, 1.8 lakh people had to be evacuated, hundreds were killed, embankments were breached, crops of over 15 lakh hectares of land were destroyed. The unprecedented floods of Surat city in South Gujarat in August 2006, which caused the damages of over Rs 21000 crore (according to Gujarat government estimate) could have been averted. Despite their awareness of huge rain and therefore of water surge, the authorities didn't take the necessary measure to face the impending crisis. Had they taken action like releasing 3 lakh cusecs of water from the Ukai dam starting from Aug 1, Surat might not have experienced such a disastrous flood. The storage in the Ukai reservoir was allowed to go up beyond normal levels, leading to sudden release of unmanageable quantities of water from Aug 7, and this coincided with the days of high tide when the river's drainage capacity was further reduced. The result was a catastrophic flood. How was this manmade disaster allowed to happen? Because no dam operator ever gets punished for wrong operation, they are not careful about their duties or following the prescribed rules. Kosi flood disaster in 2008 in Bihar was identified as another man-made disaster which resulted due to the neglect of the government. Two million people faced forced submergence and displacement, which was caused mainly due to lack of regular maintenance of embankment which developed breach and eventually crumbled. The concerned authority even noticed the breach, yet neither undertook the necessary repairing task on time nor initiated any evacuation procedure. Earthquake or a manmade disaster? It all happened when a 10 years old apartment building collapsed during an earthquake in 2001. More than ten residents died. 40 residents of Sangemarmar Apartments filed case against the developer. The builder had pleaded that the Apartments have been destroyed due to the “act of God”. The court observed if that was the case all the buildings in the area and the vicinity would have collapsed. Prior to January 26 2001, Ahmedabad was in zone IV which was vulnerable to earthquake. “The construction was therefore to be made in view of the possibility of the earthquake” stated the Commission. Eleven years had passed when Gujarat State Consumer Disputes Redressal Commission ordered the builders of Sangemarmar Apartments in Ahmedabad in early 2012, to pay varying amounts of compensations for the building collapse to the former owners of the flats who complained that the building crumbled because of the poor quality of materials used. The complainants would be compensated with varying amounts for loss of family members, loss of body limbs, damage to vehicles and other property losses. This would cost the builders over a total of Rs14 crore. Natural hazards are natural, disasters are not. When storm hits deserted island, or avalanche rolls down desolate mountains they are not disasters. It's when those hazards occur within inhabited lands and affect human lives and livelihoods, only then it turns into disasters and that's what the disaster managers are up to reducing. Disaster management and disaster risk reduction disciplines have advanced quite a long way since 1990s when the UN declared the International Decade for Natural Disaster Reduction (IDNDR). In the 1980s we struggled to overcome people's fatalistic attitude about disasters; in the 1990s with the declaration of IDNDR, we could convince the policymakers about the importance of pre-disaster preparedness while in the first decade of the millennium we managed to bring the disaster risk reduction into the forefront of the disaster management discourse. Through the process, the world has succeeded in making natural disasters less deadly, through better early-warning systems, better public information about evacuation plans, developing building codes for quake-resilient constructions, multi-purpose cyclone shelters, promoting techniques like raised homestead, floating-beds for crop production, effective government coordination at different levels, so on and so forth. By now we really have gone past the stage where we can afford to deal with disasters in an 'as usual' manner. It's rather long overdue that we go to the next level. Today we all know disasters are not natural, and that many a time it is the negligence, incompetence and often corruption of concerned authorities that lead to disasters, as evident in the stories above. In the south west of Bangladesh: Khulna, Bagerhat, Satkhira; one of the main reasons for embankments to crumble is the shrimp farmers' unscrupulous practice of cutting holes through the earthen structures to let saline water in. It weakens the structure and gives in when there is strong pressure of high tide. We have not seen a single shrimp farm owners being held responsible after Sidr/Aila, or after subsequent regular submergence of villages for the last three years. The state punishes robbers, murderers, culprits who cause problems to people. Disasters rob people of their belongings, houses and means of livelihoods on top of killing people. However, people/parties responsible for mass scale damage and destruction get off scot-free! Not a single finger was ever pointed at them. When disasters occur, we the disaster managers swing into action: work sometimes round the clock, often risk our lives by taking boats to the vast swathe of water to give succour to the disaster stricken people, and at the end of the day feel complacent that we have done a noble humanitarian work by helping some poor 'victims'. Seldom do we ask why or how the disaster occurred? Who are responsible for all the sufferings of thousands of innocent poor people? How do we become complacent? Can we bring back to the mother the child she lost in the tidal surge? Can we bring back the sari, the memory of the woman's dead mother that she had preserved all those years with deep love? Can we bring back the dream of a beautiful future that the adolescent girl used to have when her family had a nice shrimp farm and she used to walk to her school every day with her friends, and now just stares blankly all day at the water around her shack, waiting for succour from relief agencies? Who are responsible for thousands of such ominous changes of course of events and the lives of thousands of human beings for no fault of their own? After knowing all that we know, can we accept the damages wrought by Aila merely as 'an act of God? Should we not dive into the 'cause and effect' theory and identify the responsible parties who have prolonged the sufferings of innocent people and some of whom could actually be indicted and forced to compensate? That would not only lessen the burden on the government who is constantly under pressure to ease the sufferings of the people living there, but also most certainly reduce the extent of damage. It is easier said than done. It would require a lot of hard work: research, investigation, tweaking of local power structures and so on. Most importantly, who should do it? Like Sangemarmar Apartment residents, should it be the affected population in alliance with some civil society groups? First and foremost, we need to recognise the need of adding this vital issue of 'accountability' in disaster risk reduction arena. Dilruba Haider is a climate and disaster risk management professional.